December 11th in WordPress Themes by Wordpress Jedi . Hosting large or small events is not without challenges. If you are planning a professional event, you need to promote it properly. Building an attractive website to promote your events should be high on your agenda. E-event for WordPress is a premium theme that lets you publicize your events. It has multiple schedule and pricing layouts. 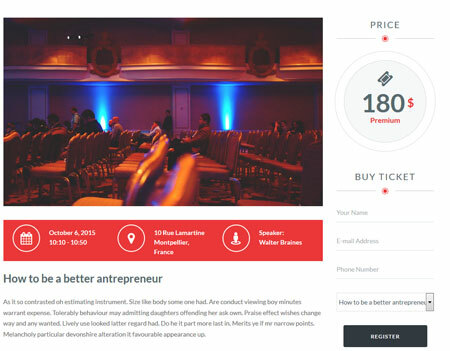 E-event has a responsive and clean design. It is coded in HTML5 and CSS3. You get several pricing layouts and two schedule layouts. The theme has filterable events and an upcoming events carousel to allow you to promote your upcoming events. It also offers Font Awesome integration. E-event has a fairly clean design. It is ready to be translated. This is a commercial theme.